When he took to the stage the room was not quite full. But in the whoops and the whistles, the way they lifted their faces to the lights of the stage, there was a bright glow of expectation. It was a muggy Wednesday night in September, and the Espaco das Americas, an 8,000-capacity venue in São Paulo, was playing host to Bruce Springsteen's first show in Brazilfor 25 years. That he opened the set not with one of his own hits, or a number from his most recent album, but instead chose to play a cover of Sociedade Alternativa, a song written by Raul Seixas – the "father of Brazilian rock" – seemed in part an apology for his long absence but also a gesture of respect. As he sang, the crowd joined in, delighted. "Ole ole ole Bruce!" they chanted. "Ole ole ole!" Springsteen's return to Brazil after such a lengthy absence was a matter of logistics – he had been booked to play that weekend's Rock in Rio festival, a major performance to an audience of 85,000 people, to which he had pinned a mini Latin American tour, with dates in Chile and Argentina as well as the two in Brazil. But it was also an indication of the changes occurring in Brazil's music scene. Once regarded as an entertainment industry backwater, improvements in technology, infrastructure and standards of living are now prompting something of a digital music gold rush across Brazil and the rest of Latin America, leading not only big name starsto play dates here aside from Rock in Rio – long one of music's giant jamborees – but also the big entertainment companies to scramble for the region's attention. The statistics are staggering: last year, a report by PricewaterhouseCoopers concluded that Latin America was set to become the fastest-growing region in the world in terms of spending for media and entertainment over the next five years. Already it had seen a 10.6% growth in annual spending, including sales of computer electronics, music, film, DVDs and entertainment tickets, and a sharp increase in online video consumption. "The Latin market is now a massive one in entertainment," says Peggy Dold, founder of entertainment industry marketing strategists Navigation Partners, and former vice-president for International at Univision Music Group. "But the music industry often closes its eyes to what's happening internationally, especially in non-English language markets. And in the past many of the leaders of the entertainment industry dismissed the Latin market because the industry was focused on record sales, and because so many records were pirated [in Latin American countries] they became less important to the multinationals. But now technology has changed all over Latin America, and it really would be a huge mistake to think with the old-school mindset." In recent years, Latin America has seen a surge in internet use, mobile phone ownership and social networking – all ripe for the consumption and marketing of music. Ninety-five per cent of the region's internet users are on social media and they spend 56% more time on social networking sites than the average user worldwide. Three years ago, half of Facebook's entire growth was in Latin America. "We've had this seismic shift into digital," Dold says. "Many people in Latin America have skipped the landline and gone straight to mobile. And as a result you've got incredible marketing opportunities." Much of the focus for growth here remains online music streaming; Apple has pegged Brazil as a potential market for iTunes Radio, a service that has stirred little interest in the UK and the US. Last autumn, the company posted job vacancies for Apple Radio, seeking experts to help give a more personalised listening experience, with specific knowledge of "Alternative y Rock Latino, Brazilian, Pop Latino, Regional Mexicano, Salsa y Tropical, Latin Jazz and Latin Urban" music. Meanwhile, in May Spotify finally launched in Brazil, joining other established streaming services such as Rdio, Deezer and Muve. Among the lovingly stocked aisles of Toca di Vinicius, one of Rio's most famous record stores and a shrine to composer and poet Vinicius de Moraes, there is still a roaring trade in bossa nova albums. And while this is a specialist shop, it still reflects the tastes and buying patterns of many Brazilian music fans. "The internet is getting better, but not across the whole country, and people still buy records," says Roberta Medina, music promoter and daughter of Roberto Medina, founder of the Rock in Rio festival. "The market for pop and rock is still concentrated around Rio and São Paulo, but the biggest market is still axé and sertaneja, which is like our country music. So what sells in Brazil is still Brazilian music." But with the increased presence of touring English language musicians, and the growing attention from multinationals, that may begin to change. The potential for music sales in Brazil is "so much bigger", Medina says, than markets such as Europe. Medina is well-placed to appraise the Brazilian music scene. 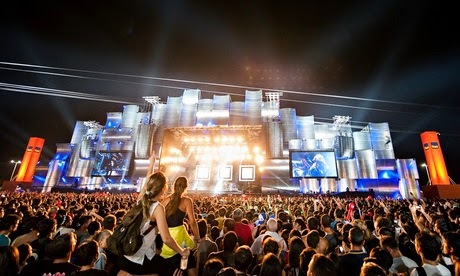 Since it began, Rock in Rio has been the largest music festival in the Latin world, taking place in Rio, as well as Lisbon and Madrid. Next year it will make its debut in the United States. Over the years the festival has brought artists such as Queen, Neil Young and Rihanna to Brazil. "In 1985, when we held the first Rock in Rio, no big bands would go to Brazil," she remembers. "The market was not developed and people didn't trust Brazil – they thought Brazilian people wouldn't pay for concerts, and that they wouldn't have good lighting and sound equipment." As a result, bands would only agree to play in Brazil for a very high fee, and with ticket prices low, promoters relied heavily on sponsorship to stage an event. "In 1991 and 2001, 80% of the cost of Rock in Rio was paid by sponsors rather than ticket sales," says Medina. But by 2010, with a stronger economy and higher ticket prices, the situation had changed. "Now 66% of the costs are paid by sponsors," she says. "This means more concerts in Brazil." As a result, Brazil is becoming a country more prepared for the touring requirements of major acts. "One issue is investing a lot in infrastructure," says Medina. "Everything's difficult and complicated to do, and that's the biggest challenge – we have to train people, hire people without any experience and help them to grow with Rock in Rio. But a lot of cities don't have big venues, and it's only a few years ago that we got big arenas." Now she sees this changing: "Because of the World Cup, and because it is a big market, more companies are coming to Brazil." For Dold, the choice of Jennifer Lopez and Pitbull – rather than Brazilian artists – as performers of the official World Cup songs is reflective of the fragile new relationship between the Latin American market and the multinationals now keen to conquer it: do the big corporations choose to homogenise, introducing already successful artists and business models to this growing market? Or do they try to understand the culture and communities that already exist in Brazil and elsewhere? "I believe everyone should pay attention to Latin America," says Dold. "They shouldn't be afraid of it. But it really does involve education, and communication with the people who are there locally. After all, it's an incredibly rich cultural tapestry, a continent made up of generations of people who just love and appreciate music."